To update the color of a link in your email, highlight the text and use the font color picker in the rich text toolbar. You can update the default link color for all links in your email by adding custom CSS to the email template. Please note: adding custom styling to your template requires a basic understanding of CSS. Hover over the email you'd like to modify and click Edit. Highlight the link, then click the text color icon in the rich text toolbar and select a color. To access more color options, click the Advanced tab and use the color picker. In the finder on the left, click the name of the email template you want to modify. 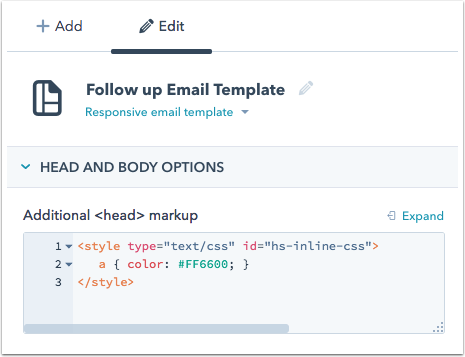 Please note: don't click any specific modules on the template to make sure the changes are applied to the entire email template, instead of a specific module. The name of the component selected will appear at the top of the inspector. Click Publish changes to apply your changes to the template.